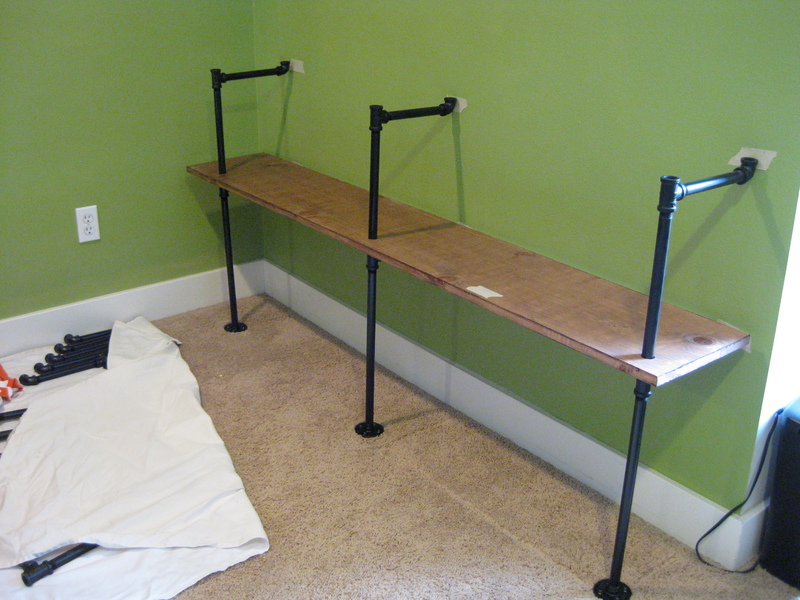 DIY Pipe Shelving — the overly detailed tutorial | DIY, Esq. 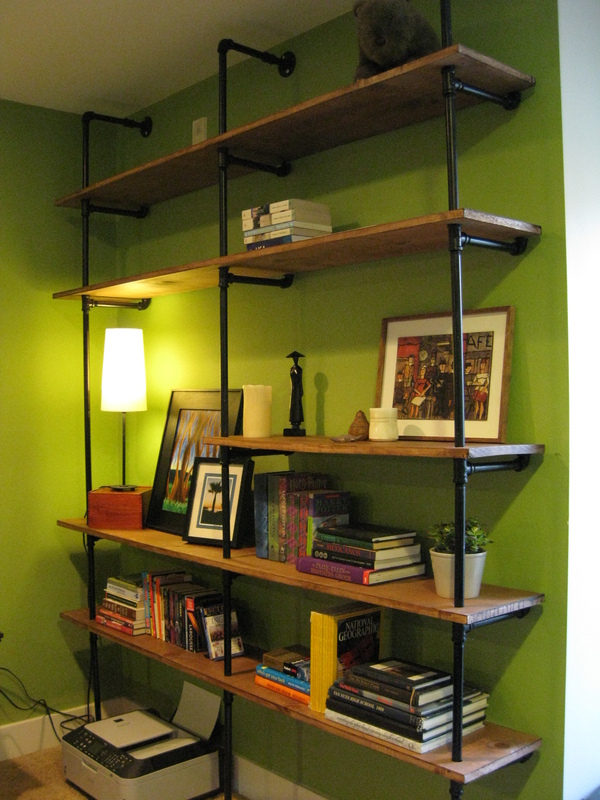 “It should only take a few hours to build, right?” <– famous last words of my best friend, Andrew, who fell in love with the look of pipe shelving and decided it would be perfect for his bedroom wall. I’d seen these DIYs all over the interweb and volunteered to help. 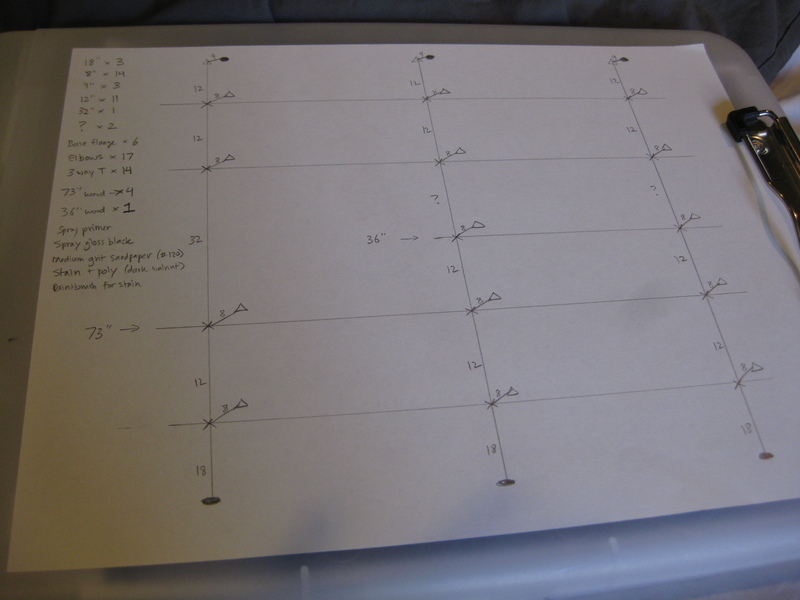 WARNING: This project is definitely doable but requires lots of planning and more work than you’d think. It’s also not cheap, but Andrew absolutely loves the end result and it’s probably a lot less than other custom-built shelving alternatives. See the steps after the jump! Preparation is key – taking the time to find and mark your studs, decide how many columns and rows, the height, width, depth and layout of your shelves. 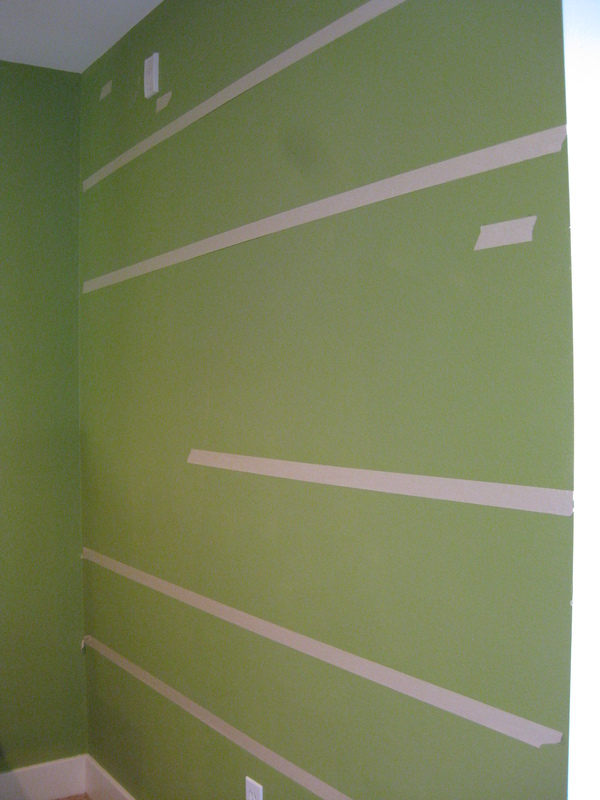 Masking tape helps to visualize. 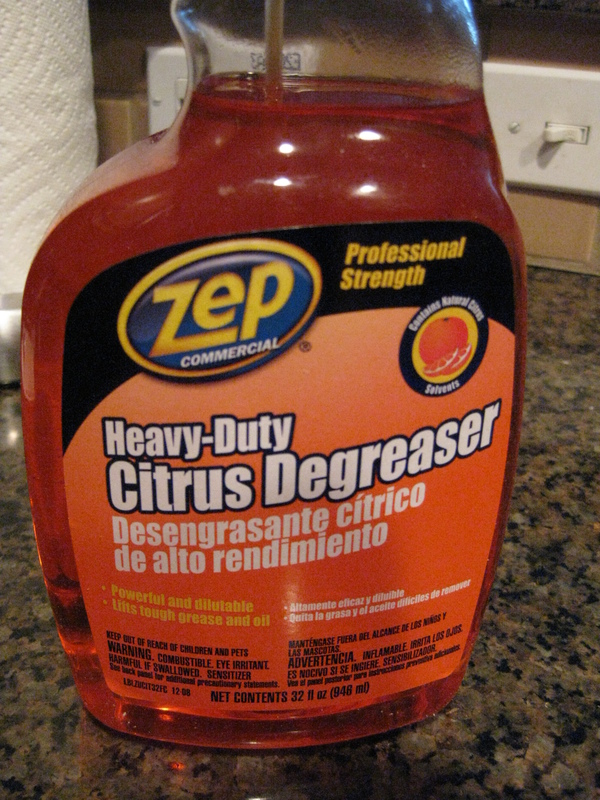 We used this stuff and it worked like a charm. Some tutorials recommend soap and water but I can’t even imagine getting all your pipes in a tub big enough and then waiting for them all to dry. 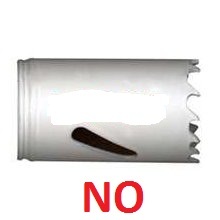 TIP: If your pipes have insanely annoying individual stickers that you have to peel off one by one, you might want to grab some Goo Gone. 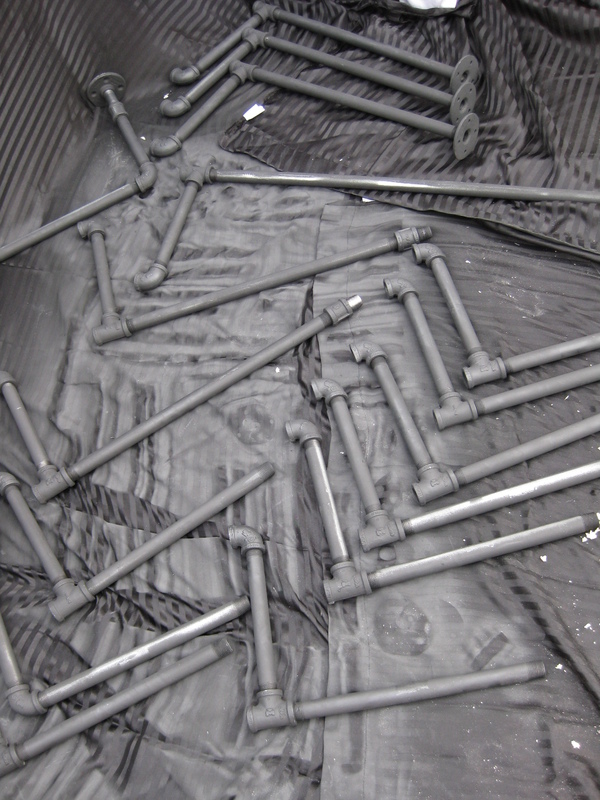 TIP: It’s super-helpful to assemble your pipes into the smaller pieces that will make up your shelf supports BEFORE you prime and paint. This way you can more easily get at all the sides. 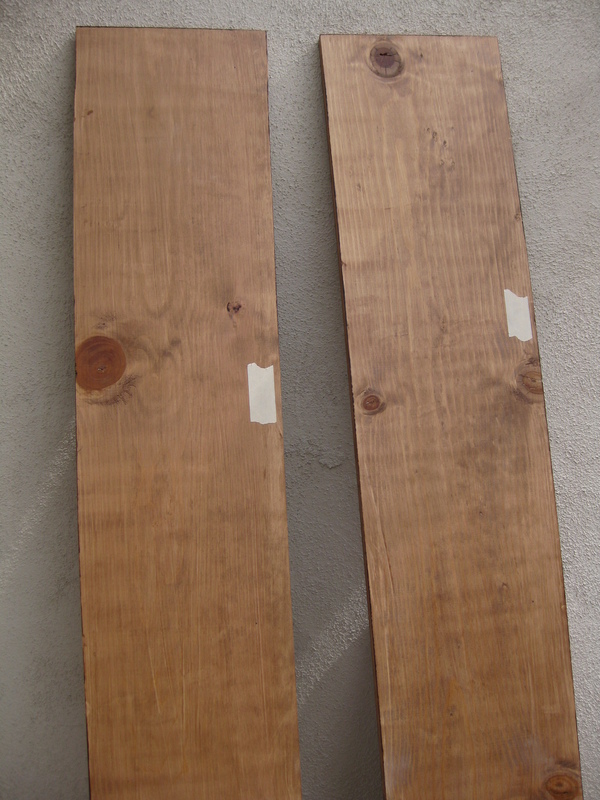 We sanded once with a medium-grit (#150) sandpaper and wiped the boards down with some old t-shirts. 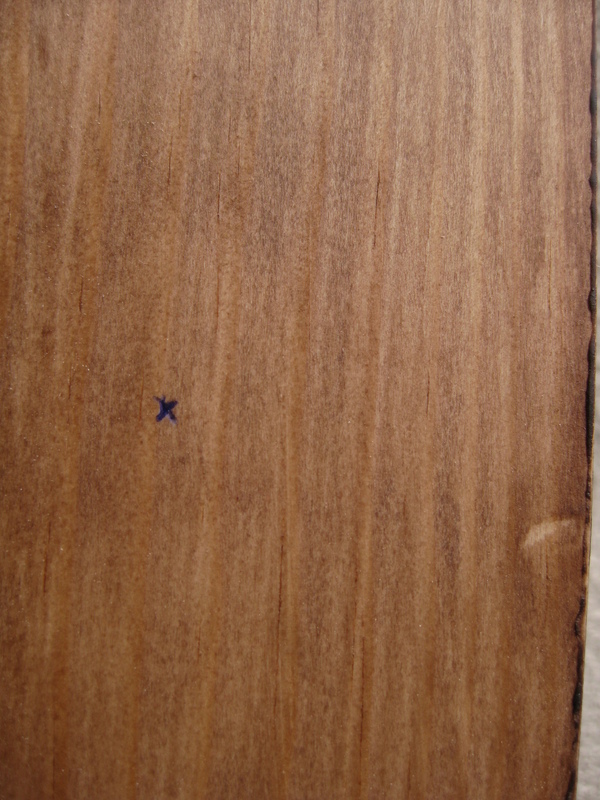 For the staining, we used a stain+poly in one in Dark Walnut and some cheap synthetic brushes (3-pack for $7). 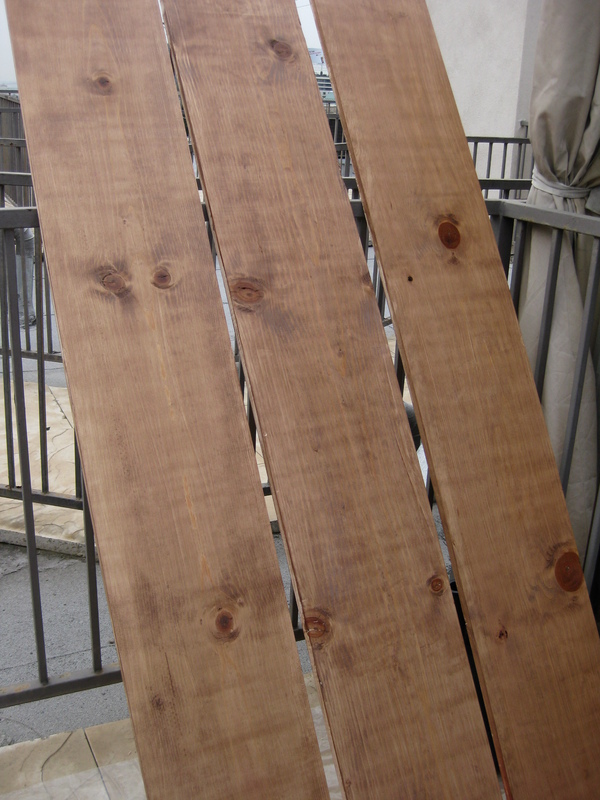 The stain turned out much lighter than we anticipated, but Andrew ended up digging the rustic look. TIP: When staining, pay careful attention to the edges and sides of the wood, where the stain can pool and create dark borders and drips. We decided which way we wanted each pine board to face (so we got the prettiest side showing), then marked with masking tape where the front edge would be. 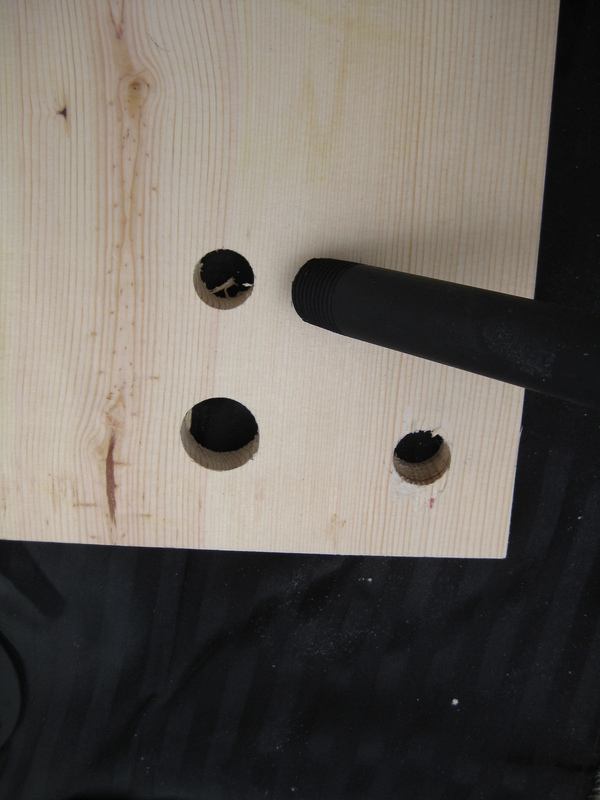 We calculated the holes for the pipes should be drilled 1.5″ from the front edge of each plank and centered on each stud. We marked those with a small “x”. This is where things got a little confusing. The tutorials we read said to get a 3/4″ hole-saw if you’re using 1/2″ pipe. But when we tested the hole-saw, it worked terribly and you can see the hole it made (top) was too small to thread our pipe through. Another tutorial said to get a 1/2″ hole-saw, which would have been even more preposterous. 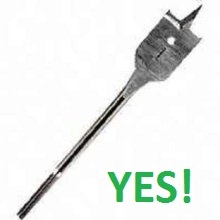 Fortunately, we had a 1″ wood boring drill bit which worked much better and (1) the 1/2″ pipe fit through with just a little bit of wiggle room (which we were grateful for later) but (2) the 3-way tee did NOT fit through –> This is exactly what you want. 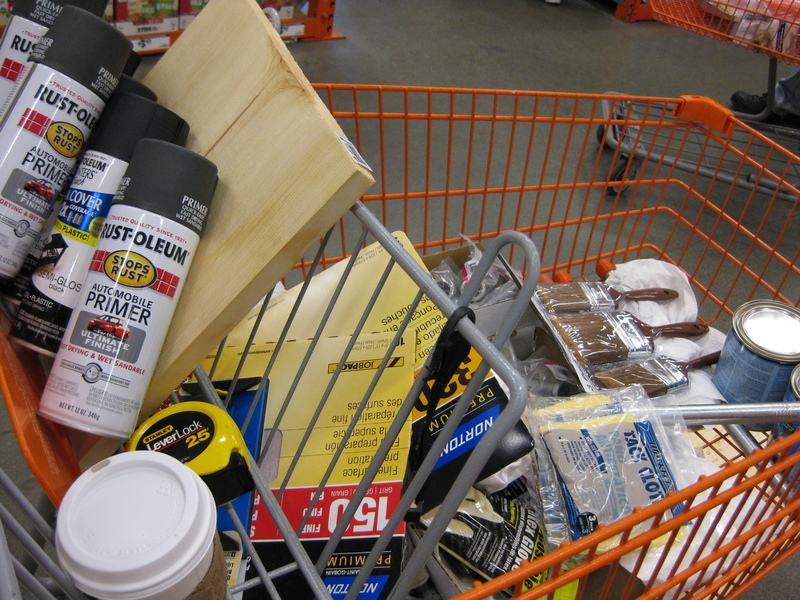 Step 8: Assemble your shelves! We worked from the bottom up and adjusted and tightened as we went. 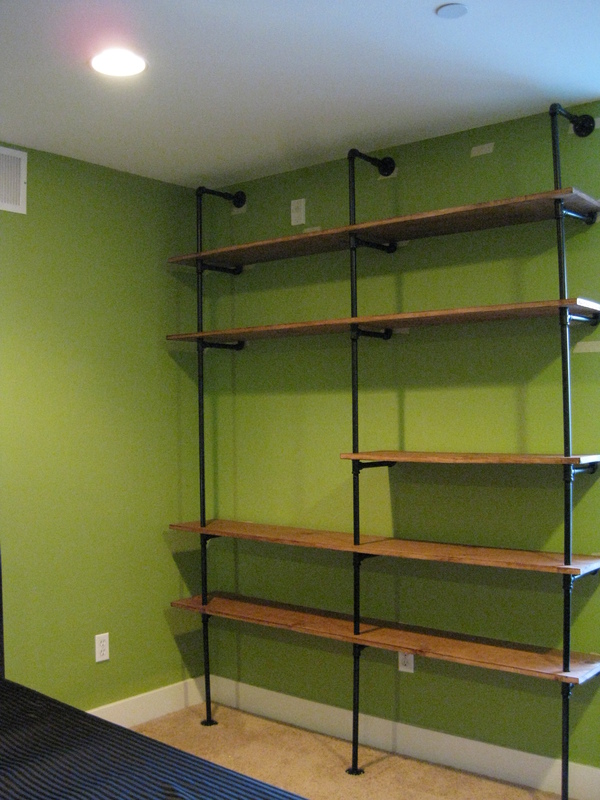 We didn’t feel the need to screw the bottom flanges into the floor – the weight of the shelves made it sturdy enough. Finally, screw your top flanges securely into your studs.